Paradise 21: the twenty first planet capable of sustaining life. 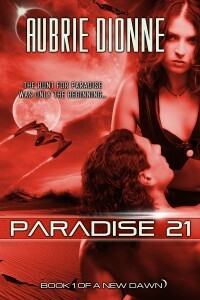 A lot of people have come up to me and asked: Why title your book Paradise 21? When choosing a title, I thought about how I wanted to write a series, and how each book could be about a different colony ship flying to a different paradise planet. Granted, I didn’t want to write 21 books! But I thought about how vast our universe is, and what would happen if astronomers found a bunch of planets suitable for life. They’d probably name them and number them as such. So, Paradise 21 was born. Aries doesn’t like her life aboard her colony ship, or her computer designated lifemate, so she escapes to a planet called Sahara 354. Not suitable for a major colonization effort, Sahara 354 is still capable of sustaining a single woman. So she plans ahead, packing lots of water bottles, and crash lands on the three hundred and fifty fourth desert-like planet found. I figured they’d be many more desert planets and ice worlds than perfect paradises. Of course! What Aries doesn’t count on is expecting another human to be there: a handsome renegade space pirate. Read Paradise 21 to find out what happens! My question to you is: If you found a planet, what would you name it? A Birthday Everyone Can Celebrate! Step right up! Entangled Publishing’s Summer Carnival is here!